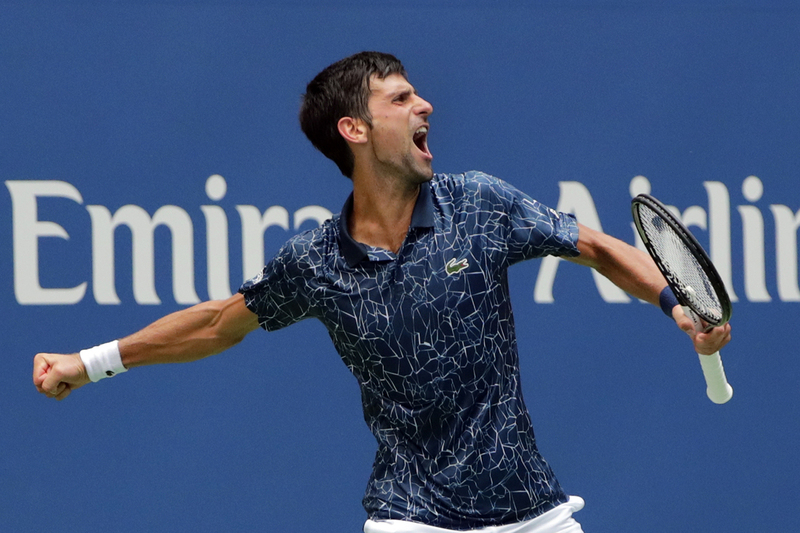 New York: Novak Djokovic suffered in sweltering US Open conditions but held on to reach the second round with a 6-3, 3-6, 6-4, 6-0 victory over Hungarian Marton Fucsovics. The Wimbledon champion, playing his first match on Arthur Ashe Stadium since falling to Stan Wawrinka in the 2016 final, received a brutal welcome back as soaring temperatures and suffocating humidity prompted organizers to offer the men a 10-minute mid-match heat break for the first time ever. “We obviously both struggled, you could see that, you could feel that, especially (over) two and a half sets, three sets,” said Djokovic, who called trainers who enveloped him in ice packed towels during a change over late in the second set. “Towards the end of third we started playing a bit better,” Djokovic said. Djokovic missed last year’s US Open with a right elbow injury. After a rocky start to 2018 he claimed his 13th Grand Slam title at Wimbledon. His Cincinnati Masters victory over Roger Federer stamped him a US Open favorite along with defending champion Rafael Nadal, despite his modest sixth seeding. Federer, the second seed, was to launch his quest for a sixth US Open title — and a first since 2008 — not under the blazing sun but under the floodlights on Ashe against Japan’s Yoshihito Nishioka. He headlined a night session that also featured 2017 women’s runner-up Madison Keys taking on France’s Pauline Parmentier on Ashe, while over on Armstrong, Maria Sharapova launched her latest bid to revive her Grand Slam career against Switzerland’s Patty Schnyder, out of retirement and, at 39, the oldest player to qualify for a Grand Slam main draw. Mercurial Australian Nick Kyrgios, the 14th seed, will be in action on Armstrong, taking on Moldovan qualifier Radu Albot with a possible third-round meeting with Federer in the offing. Australian Open champion Caroline Wozniacki played in the heat of the day, but the weather oppressing so many seemed to suit the Dane as she defeated 2011 champion Samantha Stosur 6-3, 6-2. “I just tried to cool down between games, used ice,” said Wozniacki, who also imagined she was on the beach “margarita in hand”. While Wozniacki got by with the help of eight double faults from Stosur and “trying to think cool thoughts,” for France’s Alize Cornet the steamy conditions were a “nightmare”. Cornet wept as she sat courtside, telling doctors she felt ill amid her three-set loss to Johanna Larsson of Sweden. With the women already taking advantage of a WTA recommended “heat break” prior to a third set, organizers decided Tuesday afternoon that the men would be afforded a similar 10-minute off court rest prior to a fourth set under an Extreme Heat Policy. That was too little too late for the likes of Italy’s Stefano Travaglia, Argentine Leonardo Mayer and Lithuanian Ricardas Berankis who all retired from first-round matches with heat-related problems. Romanian Marius Copil also retired complaining of arm strain and allowing 2014 champion Marin Cilic to advance. Jelena Ostapenko, the 2017 French Open champion seeded 10th, said the 10-minute heat break helped her in a 4-6, 6-3, 6-2 over Germany’s Andrea Petkovic. “I went to the bathroom and changed the outfit for the new one to be more fresh and just stayed in air conditioning for 10 minutes,” she said. Djokovic thanked organizers for allowing the break, during which no coaching was allowed. But he admitted it was odd to find himself sitting in an ice bath next to Fucsovics with their match still incomplete.